Our hope is the Kingdom of God and that is the hope that sustains us as Christians. But when culture and ministry intersect and cause division and conflict, hope can become the size of a mustard seed…and easily missed. In The Marks of Hope, authors Matt Rawle, Juan Huertas, and Katie McKay Simpson shine a light on evolving movements in the world around us, including women in leadership, changing technology, and social entrepreneurship. They illustrate how the church is beginning to grasp the Gospel call that we are all encouraged to adopt through the witness of holy Scripture—that we will not reach our God-given potential until ALL of us reach our God-given potential together. They challenge us by saying that if hope is where we’re going, and faith is trusting that the destination is where we need to be, then love is how we get there. The Marks of Hope is part of the Faultlines collection, resources intended to inform conversations around human sexuality and the church. We can say with great conviction that conflict takes advantage of the space between us. The further apart we are, the easier conflict can find room to cause havoc. Our culture has grown accustomed to smearing our neighbor with our computer keys, but it is much more difficult to slander the person sharing a cup of coffee with us. 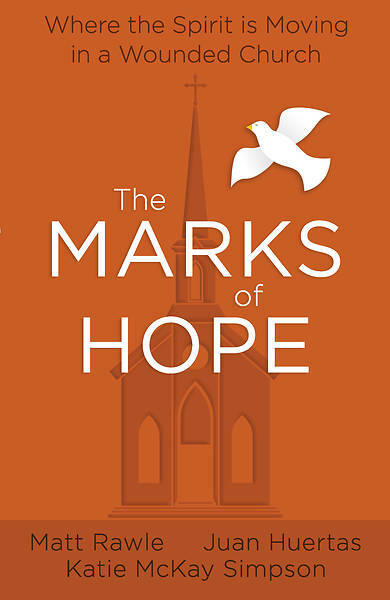 The Marks of Hope is our offering of six ways we might hold one another close with mutual love and accountability. Hope is our destination, faith is trusting in that destination, and love is how we get there."